The Monster Figure Collection promotional cards are 5 Duel Terminal Normal Parallel Rare cards released with the first series of the Monster Figure Collection. Introduces the Monsters Figure Collection in Yu-Gi-Oh!. Models of popular monsters in the latest series Yu-Gi-Oh! 5D's. 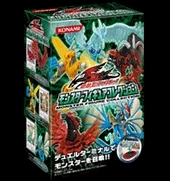 Includes cards used by Yusei Fudo, Jack Atlas, Akiza Izinski, Leo, and Luna. This page was last edited on 18 May 2017, at 03:45.